2. What is a monitor? Political Rituals: Loyalist Parades in Portadown Centre for the Study of Conflict, 1995. Parade and Protest: A Discussion of Parading Disputes in Northern Ireland, Centre for the Study of Conflict, 1996. 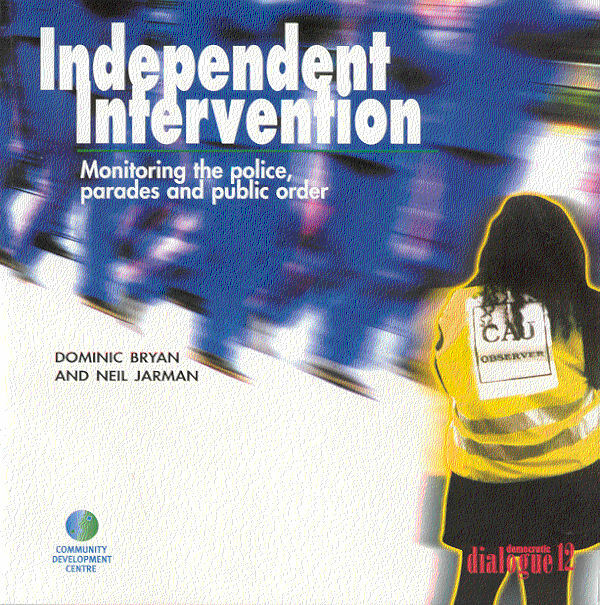 On The Edge: Community Perspectives on the Civil Disturbances in North Belfast, June-September 1996, CDC, 1997. Politics in Public: Freedom of Assembly and the Right to Protest - A Comparative Analysis, DD, 1998. From Riots to Rights: Nationalist Parades in the North of Ireland, Centre for the Study of Conflict, 1998. Drawing Back from the Edge: Community Based Responses to Violence in North Belfast, CDC, 1999. This latest report looks at the role that members of civil society have played, and continue to play, at the numerous disputes over contentious parade routes and focuses on the work of human-rights groups, community activists and stewards. The report is based on observation at numerous parades and on formal and informal interviews with people involved in monitoring and with members of the groups we discuss. However, the views expressed in this report are the responsibility of the authors alone. The authors would like to acknowledge the financial assistance given by the Central Community Relations Unit and the Parades Commission towards the research for this report. The publication costs have been supported by the Community Relations Council. Further copies are available from Democratic Dialogue or the Community Development Centre at the addresses on the inside front cover. Anyone wishing to be kept informed of DD projects and publications should contact the office, so that they can be added to the mailing list, or consult the web site. Over the past five years disputes over the right to parade have brought public-order issues to the fore in Northern Ireland. The disputes have been inseparably entwined with attempts to move from conflict to peace and have on occasion threatened to undermine the peace process and disrupt the implementation of the Good Friday Agreement. During this period a range of groups have taken it upon themselves to intervene, to try to reduce the likelihood of conflict or violence, by monitoring the behaviour of one or more of the key actors. Over the past two hundred years parades have frequently been the focus of disputes in the north of Ireland, but they have become particularly significant at times of political transition. Their current role as a site for public political confrontation began after the paramilitary ceasefires were called in 1994. Residents’ groups appeared in a number of areas to oppose Orange parades and drew support from a cross-section of the nationalist community, as the ceasefires made it easier for new political alliances to be forged. Disputes have persisted and intensified over the past four years. The marching orders refused attempts at dialogue or any suggestion of compromise over their ‘traditional’ parade routes. At the same time the Royal Ulster Constabulary became less willing to continue its historic role of protecting Orange parades and increasingly stopped them. The return route of the Orange Order parade in Portadown in early July, from Drumcree Church back into the Co Armagh town along the Garvaghy Road, has come to symbolise the complexity of these disputes and illustrates the difficulty of finding a broadly acceptable solution. In 1996, when the parade was stopped by the RUC, there were widespread public protests, rioting and violence in loyalist areas. When the parade was eventually forced through, there was extensive violence in nationalist areas. In 1997 the police again forced the parade through after violently forcing residents off the road. The following year saw more violent protests when the Parades Commission issued a determination stopping the Orangemen from taking their ‘traditional route’ along the Garvaghy Road. Protests continued throughout the year. Many other Orange parades have been blocked or rerouted over the past four years. Some of these disputes have also ended in violence. 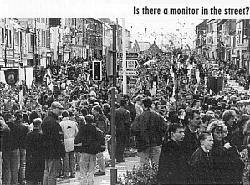 The parade along the Garvaghy Road was once again stopped by the Parades Commission in July 1999 but this year the protests have been more muted. We believe that the presence of a variety of monitors - observers, community activists and stewards - has contributed to the more peaceful range of protests witnessed in the past two years. A number of groups from within civil society have attempted to contribute to a resolution of the parade disputes by observing and monitoring events and intervening where appropriate. Monitoring has become something of a growth industry and a diverse and varied one at that. The monitoring groups express a range of aims, ideals, practices and aspirations. 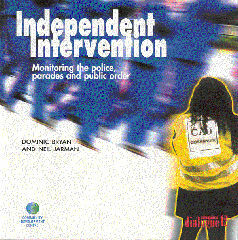 Some have focused their attention on the role of the police and the potential for the abuse of human rights. Some groups maintain a neutral, independent and impartial stance; others have expressed support for one party; still others utilise monitors clearly identified with one party. Some monitors remain in the background at the event, quietly observing the flow of action and taking notes that will form the basis of a report; others see their role as mediators and are prepared to intervene to reduce the likelihood of trouble. Some monitors are highly visible; others do not stand out from the crowd. Some monitor in large groups; others work in pairs or sometimes alone. Some are local; others have travelled from as far afield as the USA. In this report we try to unravel the bewildering complexity of monitoring groups and the diversity of their approaches, aims and practices. We begin by establishing the theoretical contexts and exploring approaches to monitoring (chapter 2). We then review examples of monitoring in a variety of jurisdictions and circumstances which we feel we provide useful comparative material (chapter 3). We then turn to the local experience, discussing the background to monitoring in Northern Ireland and reviewing the main organisations involved (chapters 5, 6 and 7). We conclude with a range of recommendations for developing good practice and extending the role of monitors (chapter 8). While monitoring is a relatively common practice, it is poorly theorised and Many of the groups that decide, or need, to undertake monitoring, end up in some way ‘re-inventing the wheel’: process, method, framework and practice are usually created from scratch rather than by drawing on experience. We hope, therefore, that this report will provide a useful starting point for generating ideas about the wider role monitors could play in Northern Ireland.